Dr. Duarte joined us in 2016, and he consistently shows enthusiasm for delivering excellence in service to our patients. He first worked in the dental field from the age of 14. 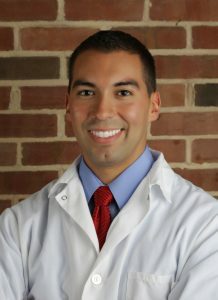 He spent summer, winter, and spring breaks working in a dental office throughout his high school and undergraduate studies before deciding to attend the University of Maryland School of Dentistry to pursue his doctor of dental surgery degree. He completed his Advanced Education in General Dentistry (AEGD) residency through New York University Lutheran Hospital before joining our team in private practice. Outside of the office, Dr. Duarte is happily married to his wife, Claire, and the couple welcomed their first child, Brooke, in 2018. “Dr. Duarte went over everything with me thoroughly and made sure I was always comfortable!” – Eric H.
“I was seen by Dr. Duarte who was also very friendly and professional…I will be going back to this dentist for all my dental needs.” – Oscar C.
“Dr. Richard Duarte is intelligent, wonderful, and gentle. It was the best dental experience ever! !” Susan K.
Thank you to all of our patients for making it a pleasure for us to come into work every day! We look forward to seeing you again soon! 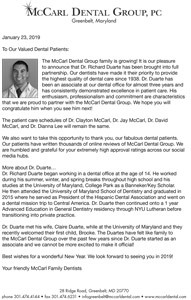 If you want to schedule an appointment with Dr. Duarte or any of our skilled dentists, don’t hesitate to call us. If you’re already a patient of Dr. Clayton McCarl, Dr. Jay McCarl, Dr. David McCarl, or Dr. Dianna Lee, their schedules will remain the same. We look forward to seeing you at your next appointment!